As we get closer to the holidays, it is an honor to me to be able to write a post about the beautiful book in the picture above. The book is Lily’s Wish, written by Barbara Pyett and illustrated by Serena Geddes. Barbara is one of my FAVORITE bloggers! Her writing is delightful, and her personality warm, humorous, and caring. At present, she is taking a sabbatical from blogging, but you will find the link here to her older posts. If you read them, you will, like me, be hoping she returns soon! And here, you will find the link to New Frontier Publishing, the publishers of the book. This is a review of her book, Lily’s Wish. 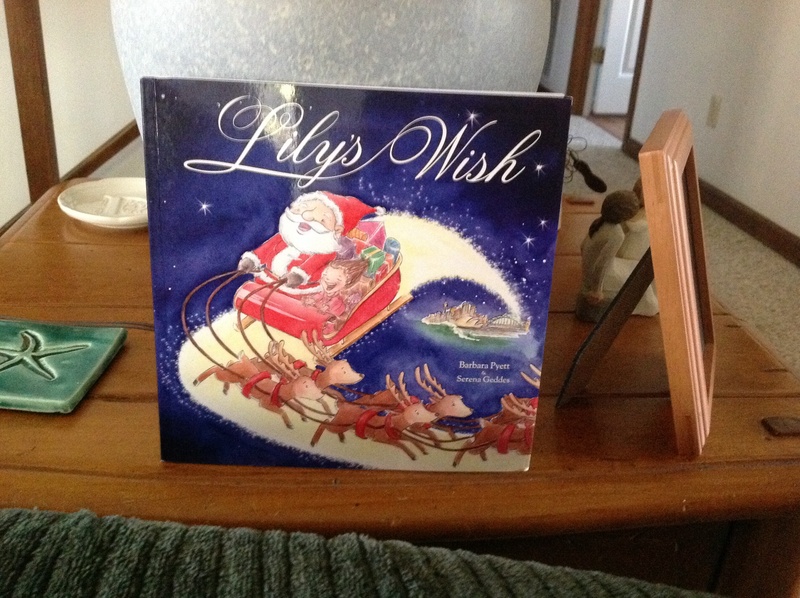 Lily’s Wish is a beautiful, whimsical Christmas book that celebrates the special love between children and grandparents. The story features Lily, a small child who wants to fly. At first, we, as readers, don’t know the reason Lily wants so badly to be able to fly. But then she writes a letter to Santa Claus, and the wish seems to take wings of its own. The author, Barbara Pyett, has written a heartwarming story that weaves together the magical moments of Christmas with a very real love that exists all year long: the love of Lily for her grandmother. The book is sure to please children as well as their parents and grandparents, perhaps especially grandparents who do not live close to their grandchildren. The illustrations, by Serena Geddes, are lovely. Children will be delighted to follow the story through pictures and discover the wonderful surprise that is revealed near the end of the book. This book will enhance story-sharing time around the holidays, both for children and for those of us who are still children at heart, especially at Christmas. Note: This book can also be ordered from Scholastic Australia. This entry was posted in Book Review, Children's books, Family and tagged Barbara Pyett, books, children's books, Christmas, Christmas books, grandparents, Lily's Wish. Bookmark the permalink.